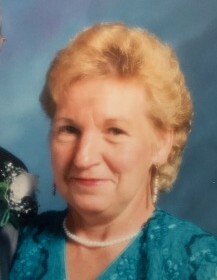 Carolyn Henderson, 76, of Radcliff, KY passed away Thursday, March 28, 2019 at Hardin Memorial Hospital, Elizabethtown, KY.
She was preceded in death by a grandson, Adam Michael Henderson. Her husband of fifty eight years, Randolph Henderson of Radcliff, KY; one daughter, Regina Lerma of Radcliff, KY; two sons, James Randolph Henderson of Maryland, Richard Michael Henderson & his wife, Mary Beth of Illinois; two grandchildren, James Randolph Henderson, Jr. & his wife, Marie, Carolina Viola Rose Lerma; and a host of family & friends. Visitation will be from 6:00 PM until 8:00 PM Tuesday and from 9:00 AM until 10:00 AM Wednesday at Chism Family Funeral Home, Vine Grove, KY.
Funeral services for Mrs. Henderson will be held at 10:00 AM, Wednesday, April 3, 2019 at the chapel of Chism Family Funeral Home, Vine Grove, KY. Burial will follow in the Kentucky Veterans Cemetery Central, Radcliff, KY.